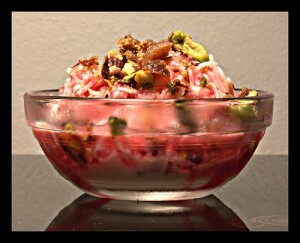 Labeshereen(Falooda) recipe by Hana at PakiRecipes.com. Rich creamy chilled dessert made with mixing of rose syrup, milk and vermicille. A beautiful colored dessert that is perfect for summer. First of all mix cornflour, milk and sugar on a medium flame and let it cook until it has dripping consistency. Remove it from the flame then let it cool for 15 min and add urqe gulab and all other ingredients. Then put it in the refrigerator for half an hour. Arqe gulab is Rose water, kishmish is Raisin and Pista is Pistachio.